Assembled with resistant and compact quality steels, it squeezes the pomegranate, precious fruit of the pomegranate shrub, without undergoing deformations in its structure or rust formations over time. With its vintage yet modern design at one time, it can be easily used. You’ll immediately enjoy a fresh-squeezed juice. It can also be quickly cleaned with running water or in the dishwasher. 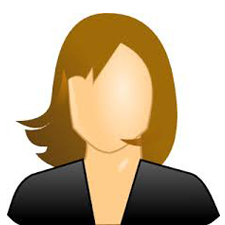 It won’t splash nor stain thanks to its funnel with a carefully designed height. 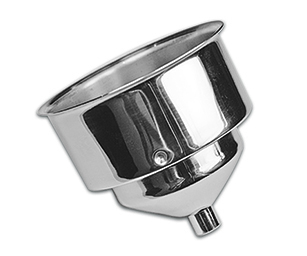 Every part in contact with fruits (funnel, extractor cone and superior pressure cup) has been exclusively made of stainless steel. 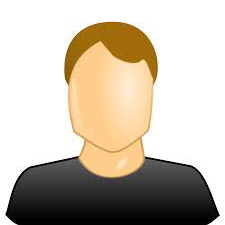 To all our customers we provide assistance service and assure availability of original spare parts. 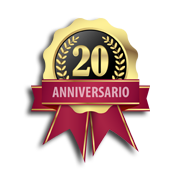 Our business as pomegranate growers began in 2000 in Salento. From that very first moment we committed ourselves to researching the best method for squeezing pomegranates. Thanks to the experience acquired through the years and aiming for perfection, we have made technical, mechanical and aesthetic improvements, in order to obtain a high quality and reliable pomegranate squeezer to be offered to the market. Our best customers, including juice stands/bars in the most important squares in Italy, can squeeze up to 150 kilos of fresh fruits a day. For all our customers, SpremiPiù is synonymous with reliability and quality. Spremipiù can easily squeeze pomegranates and even citrus fruits. You will get a juice with a delicate taste devoid of its bitterish aftertaste. Spremipiù is a pomegranate squeezer with a patented filter optimized to extract the pomegranate juice contained in the fruit. 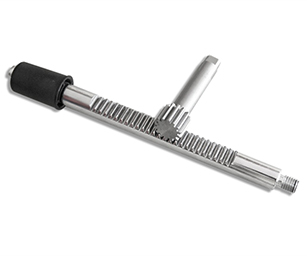 The screwed pressure lever, exclusive feature of Spremipiù, reduces the operator's efforts more than any other squeezers. As the average consumption is one juice per day for the end user, Spremipiù has a working capacity of about 40,000 squeezing cycles, which is equal to more than 30 years. 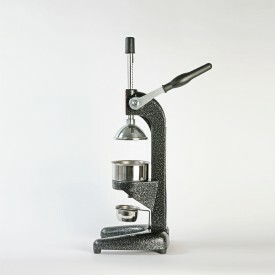 The pomegranate squeezer Spremipiù, unlike other rack and pinion squeezers, uses an upper cup in stainless steel. The other parts in contact with fruits during the pressing phase are made of the same material. pinion have the function to operate the rack when you want to prepare fresh juice. 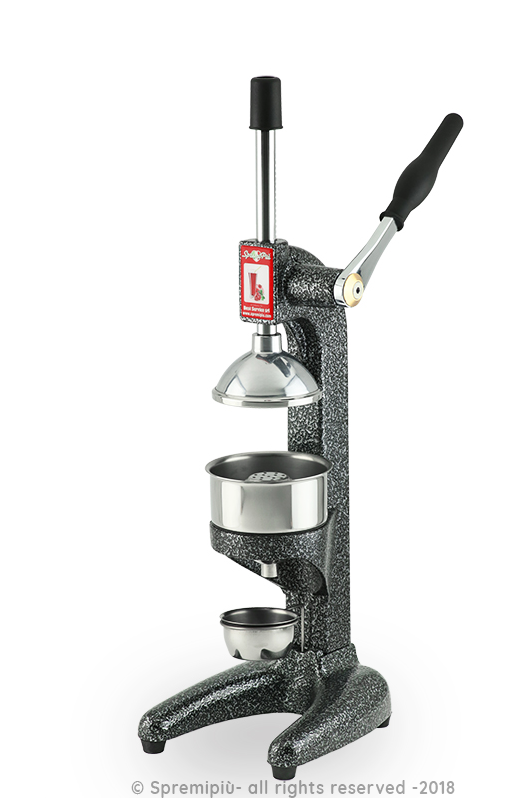 The lever must have a consistency and a length such as to allow a correct and simple cold pressing of the fruit. 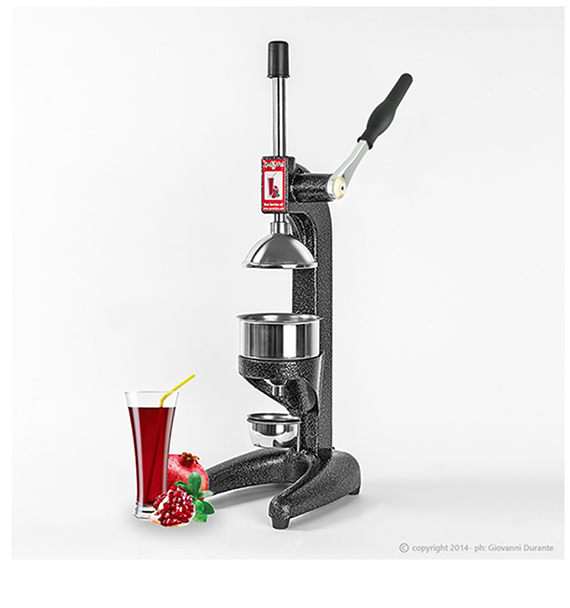 In particular, the length of the lever determines the strength that the user will have to apply in making a pomegranate juice, a much harder fruit than citrus fruits. The pinion connected to the lever on one side has to be hard enough to resist the stress and not suffer unpleasant breakage when the pomegranate fruits are squeezed. In this regard, Spremipiù has a very durable pressing system, designed to best help users easily get an excellent squeezing result without problems over time. 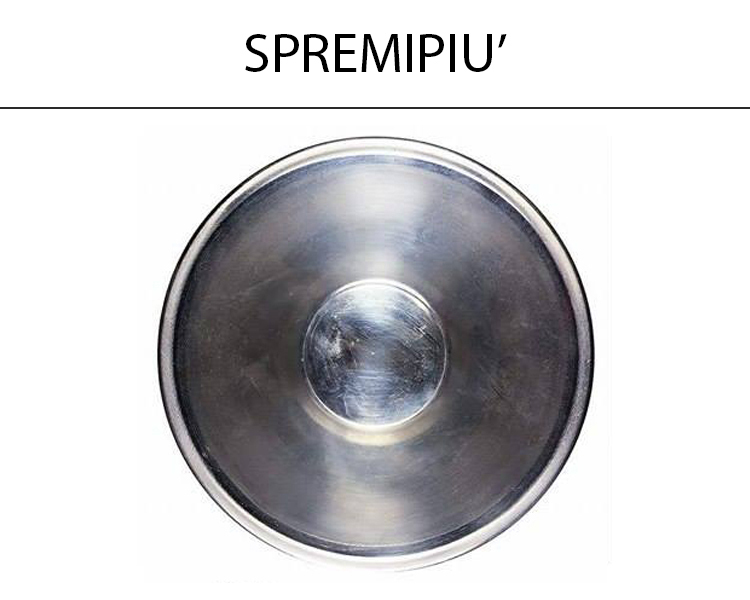 Spremipiù can handle over 40,000 pressing cycles on the lever that correspond to a large number of juices! With Spremipiù you can also squeeze pomegranates and citrus fruits of large size more easily, a result confirmed by the fact that Spremipiu’ is more stable than all other squeezers on the market. All our customers, both men and women, who nowadays use Spremipiù for domestic and professional use, know that a light pressure on the lever is enough to rapidly obtain a pomegranate or orange juice rich in antioxidants. As well as mineral salts, pomegranate juice is rich in ellagic acid, an important antioxidant predominantly present in the “placenta”, that is in the white part of the fruit where the arils are attached. This is the reason why it is important to squeeze the fruit and drink pomegranate juice on a daily basis. Made through melting, it is robust and long-lasting. Spremipiù, unlike other cylindrical column squeezers, will never undergo deformations or suffer from rust formation. 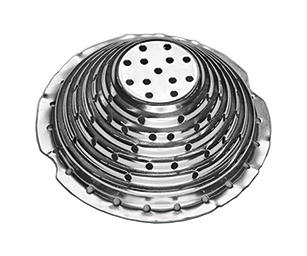 It is the main part of the pomegranate squeezer, made of very resistant steel. 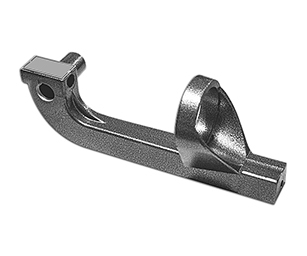 It allows the pressing operation effortlessly thanks to the lever length. In stainless steel, it keeps the work surface clean from residual drops. 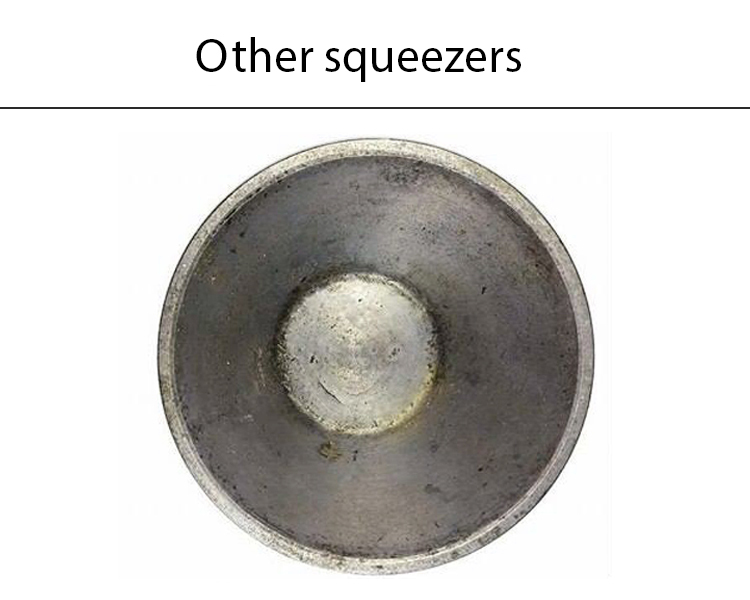 It is rotated before and after squeezing, that is, before inserting and after removing the glass at the base of the squeezer under the funnel. 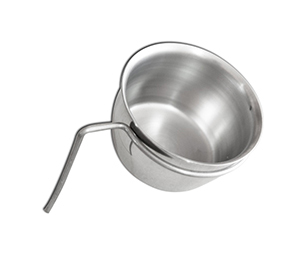 In stainless steel, the fruit to be squeezed is placed inside. It prevents liquids from splashing thanks to its height. With a larger diameter, it is therefore more suitable for big pomegranates and large-sized citrus fruits. 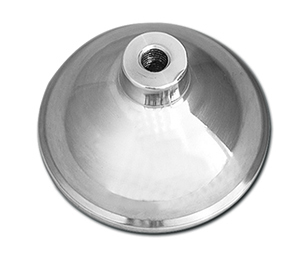 The Polished stainless steel filter keeps pomegranate seeds and other fruits from falling. 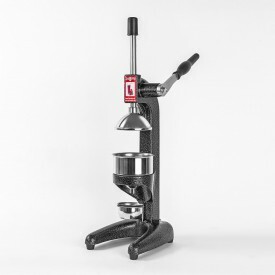 Apparently similar to others on the market, it has holes with an optimal diameter and such a scaling to extract the juice with the best yields.